Call it a neighborhood nuisance. Living in Riverdale for the past several years, I have been exposed to the “Open Orthodox” movement’s personalities, views and writings, perhaps more than I would have chosen. Having been raised and educated in a center-right Orthodox milieu, I have often found Open Orthodoxy’s approach to conflict with what I personally understand to be acceptable within a broad tent of authentic Orthodoxy. R’ Ysoscher Katz’ latest article, “Why our moral compass trumps our religion”, is just another example of the movement’s fatal flaw, its intellectual assimilation. Being Canadian born and bred, I should first focus on where R’ Katz and I agree. Shira Banki was an innocent young woman whose death is a tragedy, and all Jewish hearts go out to her family. Having recently myself lost a loved one in a very sudden way, I deeply empathize with the mix of bewilderment, pain and the seemingly bleak path ahead that her family must be going through. Yet where R’ Katz and I start to differ is that I do not attempt to capitalize on such a tragedy and use it to advance my political agenda. Putting aside the content for a moment, there is something deeply unseemly to such a tactic. What hubris enables R’ Katz to “take charge of her legacy” in a way that R’ Katz admits she “did not articulate”? Yet beyond the arguably impolitic basis for R’ Katz’ post, what I truly take issue with is the substance of his argument, which his purposefully provocative title encapsulates. In presenting his case, R’ Katz claims of a tension between people’s religious commitments to what he terms their “ethical compass”. He focuses on homosexuality in particular and claims there is “dissonance”. Labeling this a difference between “values” and “beliefs”, R’ Katz claims based on his own peculiar psychological analysis, that young people will chose the former and relegate “religiosity to the dustbin”. R’ Katz may be well intentioned, but his analysis leaves much to be desired. Also, being in my twenties, I may have a tad more insight into what my fellow millennials are actually thinking. Judaism requires of its adherents obligations of both deed and creed. While Moses Mendelssohn famously but incorrectly stated that Judaism has no dogma, the very opposite is true. R’ Bachya Ibn Pakuda places particular emphasis on this idea in the introduction to his acclaimed Chovos Halevavos. R’ Bachya writes that the Torah demands man acquires the requisite knowledge to fulfill his intellectual duties, just as one must be knowledgeable regarding the duties relating to his physical organs. Once Judaism’s obligation of thought has broadly been established, the obvious next question is what does Judaism believe. While R’ Katz implicitly argues that the Torah’s belief system, when it doesn’t comport with his postmodernism, is some sort of chok (on a basic level, a divine law whose reason is beyond human comprehension) the fact is Judaism, both the Bible and the classic commentaries attach value judgments and some reasons for its laws. Several of the more prominent value judgments include “v’asisa hayashar v’hatov” translated as you should do what is proper and is good (Devorim 6:18) which serves as a kind of catch-all; and regarding one type of false witness, the Bible says “u’vi’arta ho-ra mi’kirbecha” translated as you shall purge the bad from your midst (Devorim 19:19). There is a litany of aveiros (negative commandments), including homosexual behavior, that the Bible terms as toeivah (abomination) or zimah (unchastity). Even outside the province of Halacha the Talmud is replete with moralizing epithets such as nikra rasha (he is deemed a wicked person) or mechusar amanah (lacking trustworthiness) for those who interfere with a contemplated yet unconsummated sale or who make an oral promise to buy but fail to follow through. The classic commentaries also point to reasons for many positive and negative commandments. With respect to homosexual behavior, the Ramban (Vayikra 18:22) writes the reason for the prohibition is obvious: “it is abominable and does not lead to procreation, the first Biblical command and the primary reason for marriage” (Shulchan Aruch Even Hoezer 1:1) and therefore it is likely not a chok. Regardless of what is defined as a chok or mishpat (a divine law that humanity can ascertain to a degree), Orthodoxy would still expect adherence and not cast it away into the surrounding cultural tempest. Having established the Torah’s belief system and accompanying moral judgments, R’ Katz’ argument of belief being separate from values falls away. Beliefs are the convictions we hold to be true and our values emanate from those very beliefs. Judaism embraces intra-faith marriage and rejects interfaith marriage, ergo I value Jews marrying Jews and efforts to bring that about. I assume R’ Katz is opposed to interfaith marriage, and the question he must answer if he is opposed is, whether there is dissonance between his “beliefs” and “values” with respect to interfaith marriage? If yes, how does he reconcile them? To be clear, the desire for understanding and the thirst for meaning are central to any thinking individual, and the challenge and opportunity which Western civilization poses to the thinking Jew are not matters to be belittled. However R’ Katz also fails to present any solution to this legitimate dilemma. Alternating between offering bromides and pontificating in clichés, R’ Katz uses a vague boat metaphor that implies some sort of major reformation of Judaism. In fact, R’ Katz actually aggravates the issue with using loaded terminology such as “harsh” and “discriminatory” in describing the Torah’s viewpoint. If I can step in to the wide lacuna he left and arguably even expanded, perhaps there is a solution to the legitimate challenge that we millennials struggle with: recommitting to the classical study of the Torah (regardless of background or communal affiliation) without impugning external value systems on it. A core idea that R’ Hirsch writes about time and again is the need to study Torah “aus sich selbst”, translated as “from within itself”, and not using external value systems as the prism through which to evaluate the Torah. This can take two forms. First, the philosophical study of Judaism. I personally recommend reading Igros Tzafun, aka the “Nineteen Letters”, by R’ Hirsch. The Nineteen Letters focuses on the apparent conflict between modernity and Torah for young people. For a more modern text, “The Philosophical Quest” by my own professor R’ J.D. Bleich or “This is My God” by Herman Wouk are both excellent works. Second, there is classic limmud hatorah (Torah study). As R’ Chaim Volozhiner explains in his widely acclaimed Nefesh Ha’Chaim, studying seemingly mundane Talmudic topics such as different kinyanim (acquisitions) or tort law is how we mere mortals participate in the nature of divinity itself. 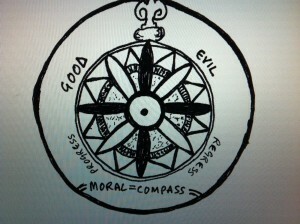 Through connecting to the divinity of Torah we can fortify our beliefs, allowing the Torah’s beliefs and values to guide our moral compass, and not the other way around. I do not lay claim to any formal training in psychology, nor am I aware of R’ Katz’ credentials in the field; however I can assure him by virtue of a proper Jewish education that comes from both the home and school, that Torah values can and are imbued in our youth prior to grappling with the challenge and opportunity of modernity. Torah Judaism is majestic, meaningful and most importantly true. As a millennial, I can say R’ Katz is correct (though clichéd) in stating “today’s young adults do not want pat answers”, yet we do not desire answers that present an intellectually assimilated Judaism bereft of authenticity. By deepening our commitment to the study of Torah and understanding Judaism’s beliefs, values, rich history and deep morality, we will be able to joyfully embrace our religious commitment and flourish in the modern era. Being a shachen tov (good neighbor), I invite R’ Katz to come by, and over a cup of coffee, I would enjoy picking up the conversation. You raise an interesting set of issues. Let me unpack them into a sequence of views you might increasingly disagree with. First, can one be bothered ethically by what the halakha demands? Second, can what the halakha demands be viewed as troubling? Third, is use by the halakha of different standards (of proof/certainty/doubt) in the cases of mamzerut or agunah, indicative of a value system within halakha based on general notions like ve’asitah et hayashar ve’et ha’tov or kavod ha’briot? Fourth, is use by the halakha of different standards in the cases of mamzerut or agunah, or Hillel’s invention of prozbul, indicative of a value system from which notions like ve’asitah et ha’yashar ve’et ha’tov, kavod ha’briot, ve’chai ba’hem, etc. are introduced into the halakhic system? I wonder where Rabbi Katz might become uncomfortable. FWIW, I am OK up until the fourth step, where the language would have to be (significantly) modified. Dr Bill-re your discussion of Prozbul, both R Rimon and R Asher Weiss discuss the relevant sugya and how the same is understood by the Rishonim. I think that a strong case can be made that the Torah empowered the Chachmei HaMesorah to utilize halachos such as Hefker beis Din Hefker and Yesh Koach Lchacachim Lakor Davar Min HaTorah in financial matters in a very strong way, so as to prevent financial imequities and allow for Chesed between fellow Jews. There’s apparently a lot of reward (psychic? monetary?) in identifying an outcome one really wants to achieve and then creating or recycling Jewish-sounding theories that could help justify it and make it happen. Heading into Elul, we all need to understand the amazing human power of rationalization. It’s in us ,too, not just in them. @ Dr. Bill – Interesting way of expressing it. I agree with 1 & 2 Not sure what you mean exactly in 3 but I possibly might agree. Shmuel W, I organized it because of traditional sources supporting 1 and 2. The last two are very complex, and I do not have references outside of non-traditional, academic sources. For example, the halakha as practiced unquestionably allows wider attitude in preventing declaring someone a mamzer. Is the basis of that wider latitude strictly halakhic at one extreme or entirely based on ethical concerns, at the other? A number of intermediate positions between those two can be formulated. My read of the post would lead me to believe the author would become uncomfortable earlier than you. http://www.torahmusings.com/2015/08/why-are-young-people-leaving-religion/ The above linked article and R Y Katz’s claim that young people “don’t want answers” are part of a larger issue-Regardless of how you view yourself hashkafically, intellectual honesty requires parents to accept and realize that they are transmitting a Mesorah , a legacy and tradition of Torah, Avodah and Gmilus Chasadim to their children, as opposed to merely providing an expensive private school education with Judaic studies, and “doing Shabbos and the holidays.” If a parent cannot provide an answer to the question to the next generation of “why be Jewish”, and is viewed by his or her children as having either a marginal or worse attitude towards Torah observance and rabbinical authorities , he or she can be seen as simply not fulfilling their obligations of transmitting this legacy to the next generation. I think that a pareve attitude towards passing on this legacy logically leads to an attitude of as long as my children lead a productive and “ethical life”. it should not be viewed as a catastrophe or a failure if they decide not to be observant as adults.